To celebrate the autumn season, we will create Fall Plaques. 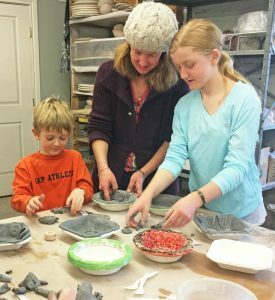 Participants will work with an instructor to add leaves, acorns, pumpkins and squashes to highlight their most cherished aspects of the season. Plaques can serve as purely decorative, or be used as functional pieces, such as hotpots. The birds are flying south, the leaves are brightly colored, and the squirrels are hard at work! We see them out and about, securing acorns for the long winter. Today we will work to create our own Fall furry friends, as we sculpt squirrels and their bountiful collection of acorns! Bring warmth and light into you life when you join us in creating of your own Lantern! Work with an experienced instructor to design and build a candle-lit lantern, perfect for the holiday season! Join our experienced instructors in creating a personalized Bell, to ring in the Holiday season and New Year! Clay Art Center, 40 Beech Street, Port Chester, NY 10573.